LOS ANGELES (AP) — Backup goaltender Malcolm Subban got just six goals from the Vegas Golden Knights while going 0-5-0 to start the season. The offense came through against the Los Angeles Kings on Saturday, and Subban delivered another solid performance to keep the surging Knights rolling. Subban stopped 30 shots to help the Golden Knights beat Los Angeles 4-1, ending the Kings' four-game winning streak. "Come the end of the game, I could tell the guys around the bench were happy for him," Vegas center Paul Stastny said. "Made some big stops early in the game, and I think we just kept kind of digging into them. Even the goal they scored was our fault, we kind of let him down a little bit." Stastny and Alex Tuch each had a goal and an assist, and William Carrier and William Karlsson also scored as the Golden Knights improved to 6-1-3 in their last 10 games. Vegas also defeated Los Angeles for the first time this season after losing the first two games of the five-game series. "They were on a heater lately, so we wanted to show we could come in here and beat them," Subban said. "Obviously last year we did pretty well against them, including the playoffs. Being down 0-2 we felt like we needed to finally get a win against them, and we're glad to get it sooner than later." "We just didn't play enough in the second," Kings coach Willie Desjardins said. "Wasn't that I didn't think the effort was there, we just made plays that we shouldn't have made. Our work is cut out for us." 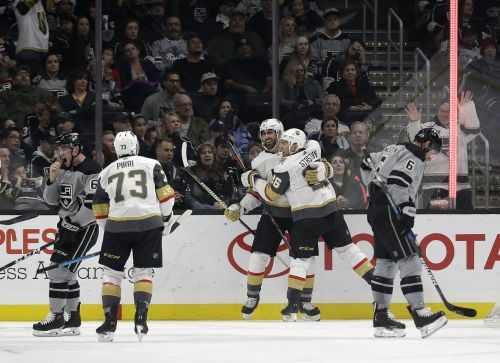 The Golden Knights went up 1-0 at 4:55 when Carrier when he redirected Cody Eakin's shot past Quick, but the Kings tied it at with 5 seconds left in the opening period when Kopitar tapped in Sean Walker's shot between Subban's legs. Subban was able to immediately move past allowing the late goal, saying he treated it as a brand new game was about to start. Stastny said that attitude is what has made Subban so effective working behind starter Marc-Andre Fleury, even if it hasn't resulted in wins. "He's been patient," Stastny said. "He's had a positive attitude, and he knows it's going to come." Tuch's 13th goal of the season would end up being all the support Subban needed, but Karlsson scored on a breakaway off a stretch pass by Nate Schmidt to extend the lead to 3-1 at 3:20 of the third. Stastny added an empty-netter with 2:32 remaining, giving him four goals and three assists in eight games since returning from a lower-body injury that caused him to miss 30 games. The Kings had their longest winning streak of the season ended, along with a season-best stretch of five straight games earning at least one point. "The big thing is now we can't let this one (loss) turn into two and three and four," Kopitar said. NOTES: Golden Knights D Colin Miller (upper body) was placed on injured reserve. ... The Golden Knights claimed F Valentin Zykov off waivers from Edmonton. Zykov has four goals and seven assists in 30 career games for the Oilers, Carolina and Toronto. ... The Kings activated D Dion Phaneuf (upper body) off injured reserve, but he did not play for the seventh straight game.